This recipe is really, really fast and easy (especially if you buy a store-bought crust). Once you buy the ingredients the first time, you should have enough on hand (except for almond milk) to make several pies. I got the recipe from the lovely ladies at The Post Punk Kitchen, to whom I first turned when I started eating vegetarian about a decade ago. This is the perfect thing to make this weekend if you want a little homemade something special for your valentine. And, really, it’s mostly almond milk — it’s practically health food! 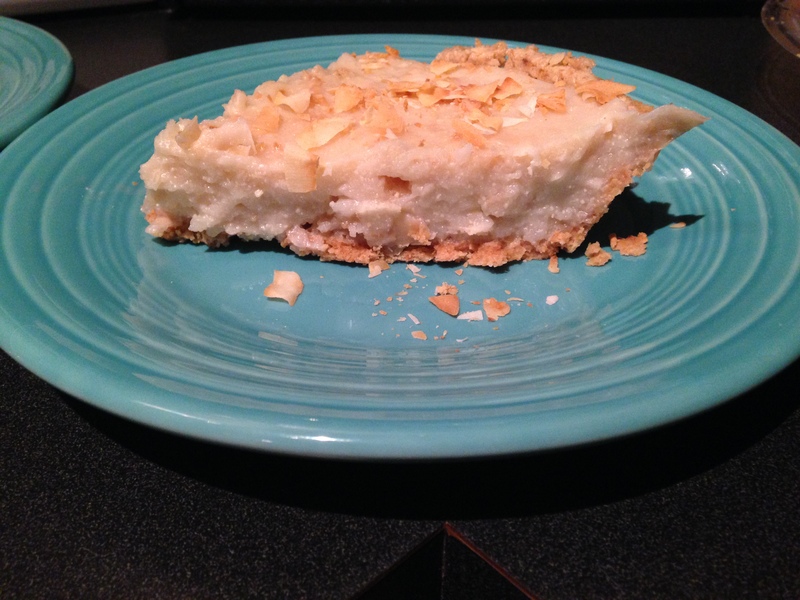 Since my Valentine has had this quite a bit in the last couple of weeks, tonight I’ll be dipping back into the archives and making what I made last year for V-Day — vegan coconut cream pie. I took the photos the first time I made it and didn’t have any whipped cream or berries or anything on hand. It got good reviews on another night topped with strawberries. To make your own crust, use 1 3/4 c. cookie crumbs, add 4 Tbsp. oil or melted vegan butter (my preferred is Earth Balance), 3 Tbsp. sugar and 1+ almond (or other non-dairy) milk until it’s just moist enough to press into the pie plate. Pop into the oven for the 10 minutes and proceed with the recipe! 2. In a small (2-quart) saucepan, combine 1 c. almond milk with cornstarch and whisk until the cornstarch is dissolved — it doesn’t take long. 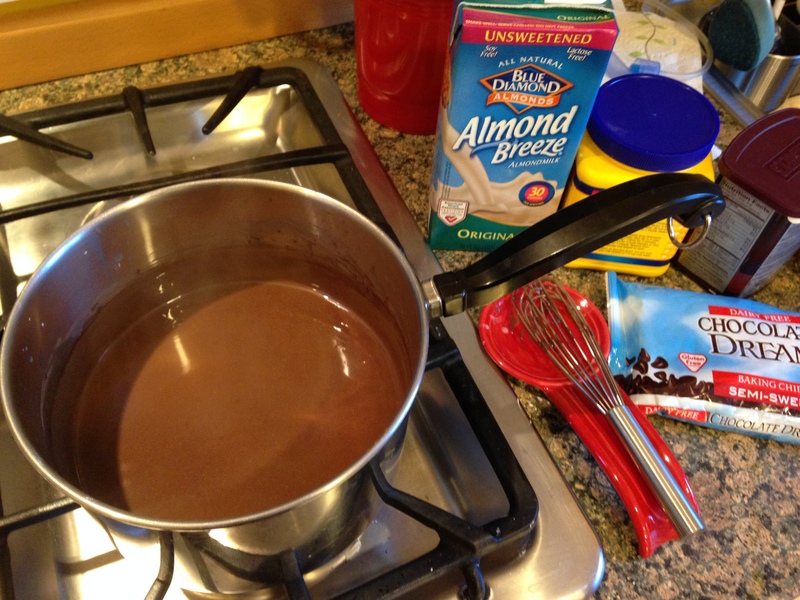 Whisk in remaining milk, sugar, cocoa powder and salt. It’s OK if it’s a little clumpy at first. It will all work out eventually. At first it will have the color of chocolate milk. 3. Bring the mixture to a boil, whisking occasionally. Keep a close eye because once boiling you want to lower it to a slow rolling boil. If you have an electric stove, you may want to switch it to another burner you have on low or lift it off the burner for a minute as it cools so it doesn’t burn on the bottom. Whisk consistently until the mixture is thickened and pudding like, 7 to 10 minutes. 4. By the end it should be a darker, classic chocolate pudding shade of brown. Add chocolate chips and whisk to melt. Stir in vanilla. 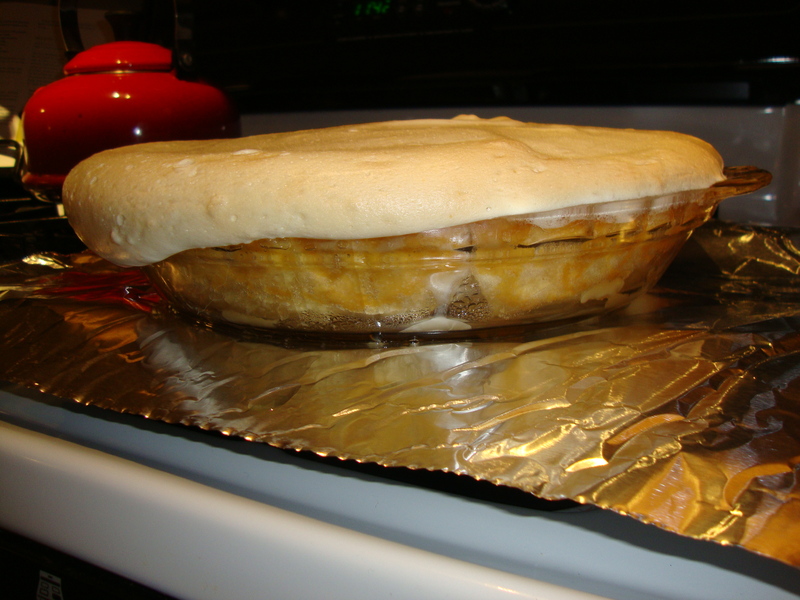 Pour the pudding into the pie shell and let cool for about 15 minutes on the counter, until it stops steaming like crazy. 5. To keep a skin from forming, place a circle of parchment paper over the filling. (I do this by inverting the pie plate before I start, or using the lid to the store-bought crust and tracing, then cutting). Refrigerate and let set for at least 3 hours. If you don’t have quite that much time, use a bigger pie plate/crust and it won’t be as thick and should set up a little faster. Several weeks before I had my baby, my sister decided she would host Easter so family could gather and meet her. Around that time I came across this recipe for Betty Crocker’s lemon cake, veganized by a couple who went through Betty’s whole book and veganized it, posting recipes to their blog Meet the Shannons. They also published them in their debut cookbook Betty Goes Vegan. As much as I’m trying not to buy cookbooks, I really think I need this one. Everyone told me just to bring the baby and nothing else but, well, I don’t really know how to do that. 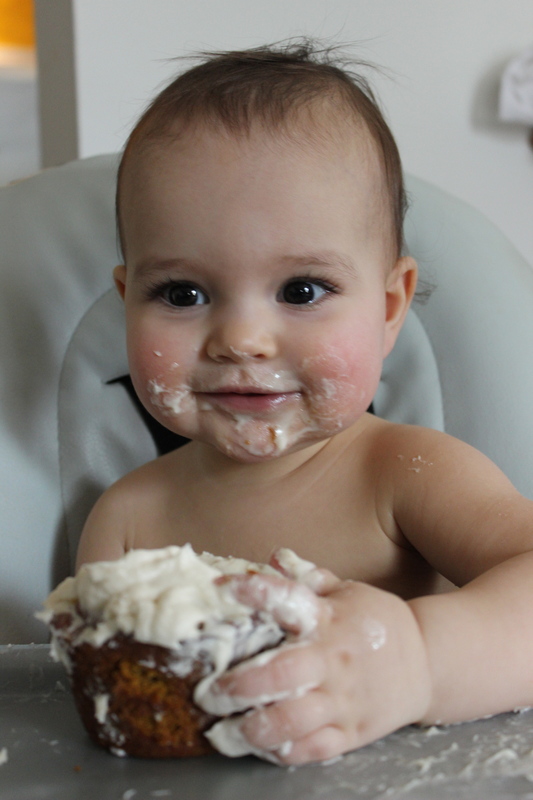 And the more I get submerged in the all-consuming schedule of a new mom the more I wanted to make it happen — bake a cake! Like I used to! Or maybe would have! 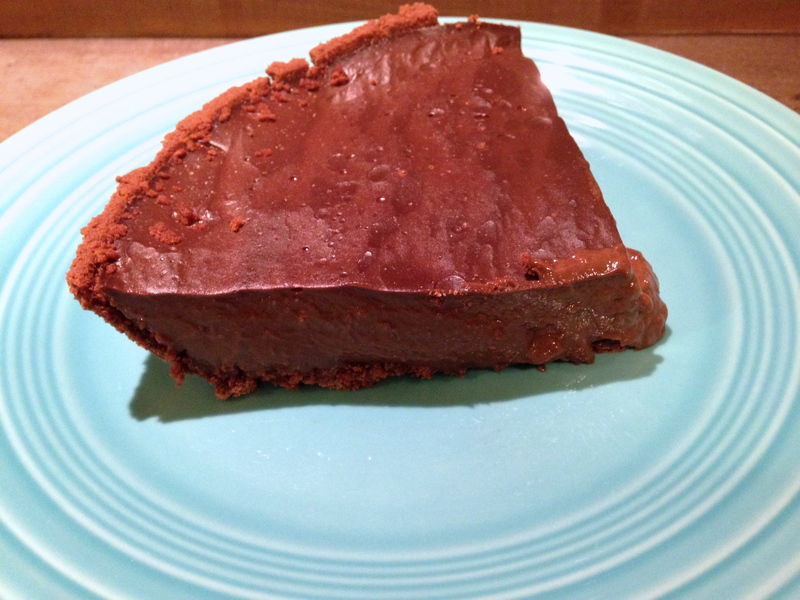 It has basic ingredients, all of which I had on hand, so I went for it. Besides, I really wanted to use that bundt pan I just HAD to register for when we got married almost two years ago and still haven’t used. So, I did it. “Wait, WHY are you making a cake?” I got on Easter morning when my husband woke up, thinking I already would be en route to my sister’s for those who had asked for extra baby time before the masses arrived. Oops. If the last five weeks are any indication, I may not be “on time” (yes, in quotes as it’s relative) for the next several years if you invite me somewhere. As I was running late, there are no pictures. Well, that, and it was ugly. Though I generously sprayed my pan, I couldn’t wait for it to cool completely and the nice golden brown outer layer stuck to the pan upon removing it. I also REALLY wanted to put it on the lovely vintage cake stand my mother-in-law got me at my baby shower, but it was the exact size as the stand. That doesn’t really work — especially when there’s glaze involved. I made a mess, had to transport it to a bigger pan and it started to fall apart. It wasn’t pretty. And the lemon glaze? Well, you have to keep it warm to pour it on when the cake is cooled a bit and I made it before I showered. So, but the time I poured it, it wasn’t the nice lemon yellow color displayed on the Shannons’ blog, but more of a golden brown. That’s OK though. I thought it turned out delicious and, as much as I hate to say it, it’s super moist without being too dense. It got rave reviews from the small group that passed up my mom’s (non-vegan) coconut cream and cherry pies (I don’t blame anyone for choosing those however. All of her pies really are the best). This was really fast and easy to make though — I’ll be revisiting this recipe for sure. My window of sleeping baby is closing. Better get to it! In another bowl, mix Flour, Baking Soda and Salt with a whisk until completely blended. Then add the Flour mix to the Margarine mix a little at a time – alternating with Coconut Milk. Each time you add some Flour or Coconut Milk, use your mixer to blend it in completely. Once your Flour and Coconut Milk are completely blended in add your Lemon Zest and Lemon Juice and blend on a medium setting for 2-3 minutes. You want your batter to be fluffy and smooth. Spray a fluted tube cake pan with Baking Spray. Then pour your Batter into the pan evenly. Use a spatula to spread it out to make a nice even layer. It’s important to make sure the Batter is even because the cake will be sitting with the rimmed ring on top. So if you see any ridges or clumps be sure and smooth them out now. While your cake is baking, make your glaze. In a saucepan, melt your Margarine on a low heat. Once your Margarine is melted, use a whisk to blend in your Powdered Sugar. Then blend in Lemon Zezt and Lemon Juice. The glaze is pretty sweet. If you taste it and are like this is too sweet for you – just add a little more melted Margarine and Lemon Zest until you get the flavor you like. You’re going to want to keep your glaze warm till you drizzle it over the top. Pull the cake out once it is fully baked and immediately poke your cake several more times – like 15 times with the bamboo skewer. You only want to go in about as deep as a fork would go. You’re releasing moisture from the cake to help it cool and also release from the pan. Let your cake cool for 20 minutes and then turn your cake pan upside down on a large serving dish. (It had been at least 30 by the time I did this, but the cake still stuck to my non-stick, heavily-sprayed pan. I think it would have come out perfectly if I had let it cool completely). Now drizzle the warm glaze over the top and let your cake cool. In the springtime – it’s nice to decorate lemon cakes with edible flowers. I couldn’t find any this time. Pity. I have a cookie problem. Not that I eat them a lot, but I want to. I really, really want to. I mostly fulfill this pregnancy craving by eating a Larabar. Yes, Larabar, your “peanut butter cookie” is quite delicious. Alas, it is not a cookie. The other night in my regular quest for new recipes to try, I stumbled upon a recipe for vegan snickerdoodles — the classic cookie that is more or less a soft sugar cookie with a cinnamon-sugar coating. I couldn’t take it and closed the tab on my bot. Two days later…still thinking about them. I couldn’t find that original recipe I saw the other night, but a quick Google search turned up this one from Vegetarian Times. I decided to kick it up a notch (to basically a HEALTH FOOD, am I right?) by using Bob’s Red Mill Gluten-Free All-Purpose Flour, making them gluten-free AND vegan. My stepdaughter was key to the process as the chief roll-in-cinnamon-sugarer. They came out a great! A little cakey/crumbly, but really tasty and totally satisfied my cookie desires. And all with about 20 minutes of prep time. The original recipe said it would make 45 cookies, whereas we got about 25. Maybe ours were a little too big. Either way, it all worked out! I’ll continue to try to keep my craving in check. But when I can’t take it anymore, this will be a go-to quick and easy recipe. 2. Whisk together flour, cornstarch and baking powder in a small bowl. 3. In a large bowl, beat softened butter with an electric mixer. Add sugar and beat until fluffy. 4. Beat in milk and vanilla for about 30 seconds until smooth. Add flour mixture (I did about half the bowl at a time) and beat until smooth. 5. Combine cinnamon and sugar. 6. Shape dough into 1-inch balls. Roll each ball in the cinnamon sugar and place about 1 1/2 inches apart on greased cookie sheet (I didn’t grease the sheet and it was fine but there were a couple that stuck a little bit). 7. Bake 10-12 minutes or until cookies look dry on top and are lightly browned on the bottoms. 11 minutes was perfect for ours. Let cool and store in an airtight container. If you’re a person who deprives yourself of dessert because of the sugar, empty calories, etc., I’m about to change your life and blow your mind. Or at least your tastebuds. I would challenge anyone to make this and tell me you don’t think it’s delicious. It’s so hard to believe that you’re eating fruit and nuts and that’s it! You won’t miss the butter and oats and sugar, I swear. I started making this a more than a year ago for a raw vegan client and was instantly hooked myself. I got the original recipe from a raw cookbook (I think it was blackberry crisp) and we experimented with different fruits until she found her favorite, which was pear-blueberry. Today, I decided to make it for breakfast. That’s right. Dessert for breakfast and it’s not full of garbage. I can’t believe I didn’t think to do that before! I enjoyed it with a cup of tea and a tall glass of fresh (kale-carrot-apple-beet-plum-ginger-apple-clementine) juice. It was perfect and felt so indulgent. I’ve tried lots of different fruit in this — anything soft will work, including berries, pear, peaches, mango, etc. 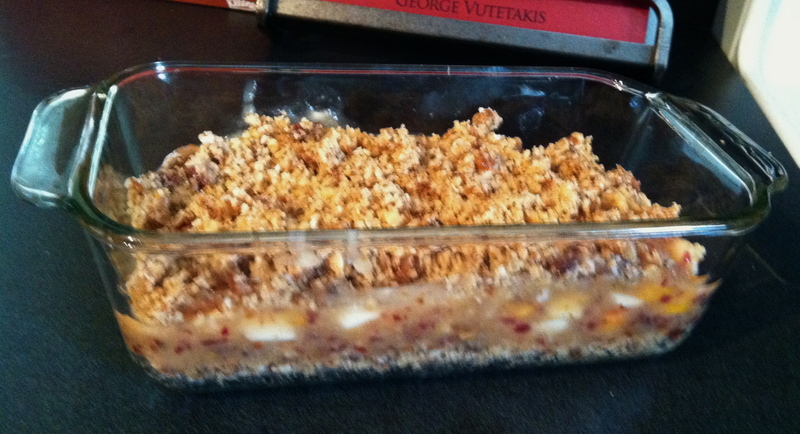 This is a really great thing to make when you have fruit that’s starting to turn, which was the case in my house today. I used pears, peaches and grapes. It turned out great! 1. Place walnuts, coconut, cinnamon, nutmeg and salt (if using) in your food processor and pulse a few times. 2. Add UNSOAKED dates, raisins and sugar (if using) and process until until the mixture resembles coarse crumbs and will stick together if you press it together with your fingertips. If your dates aren’t the freshest you probably want to run your knife through them real quick so your food processor doesn’t have to work so hard. Pour mixture into a bowl. (This can also be frozen if you want to make a big batch of it and save some for the next time you want to make some crisp! 3. Place half of the diced fruit into the food processor, along with soaked dates and lemon juice and process until smooth. Mix this with the diced fruit. 4. Press half of the nut mixture into a dish. I find a full recipe fits perfectly into an 8 x 8 glass pan. I often make half of a recipe, which fits perfectly in a loaf pan (as pictured above). It’s great at room temperature, but if you want it to be a little warm and still raw, heat your oven to 200, turn it off and place it in the oven for about 10 minutes. Of course if you have a food dehydrator, you can put it in there too. I often pull all the trays out of mine and place it in there at 115 degrees for about 20 minutes. 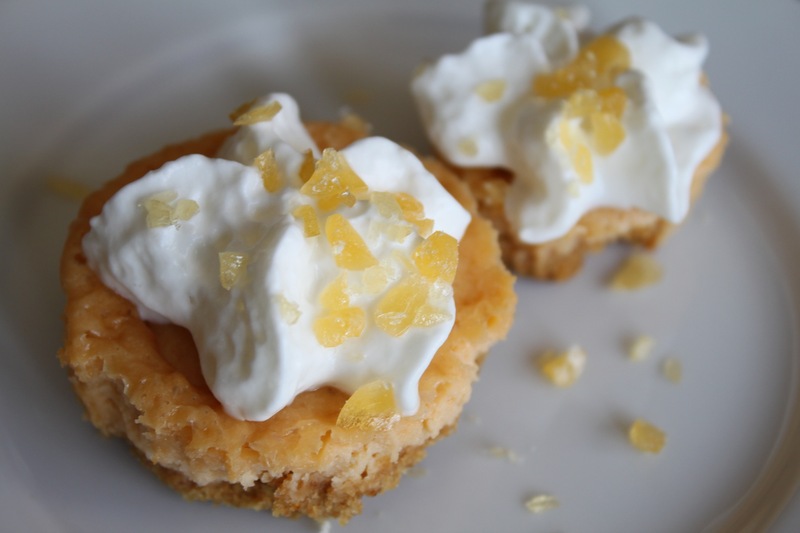 I decided butterscotch cheesecake must exist and did a quick Internet search. I had a lot to do today, so it had to be quick, and this recipe (which was listed on several Web sites) sounded like it would fit the bill. Fast, only a few standard ingredients and freezable. Why freezable? I think when you’re pregnant you can go for that second slice of cheesecake — I mean, after all the baby wants more, right? After is a different story. I think S wouldn’t as much appreciate me shoving a whole cheesecake in her “now I lose the baby weight” face. SO, I decided mini cheesecakes would do the trip. The family can eat, a bite or 2 at a time, as much as they want, and in a couple of days (or… before if we’re smart) we throw the rest in the freezer. Here’s the recipe, which is supposed to work for a 9″ springform pan. For me, it filled about two dozen mini muffins and eight regular muffin cups. I’ll buy an ingenious mini cheesecake pan before I do this again so it will be prettier for you. For these I used regular muffin pans with paper liners. 1. Mix melted butter, graham cracker crumbs and brown sugar. Press into bottom of pan. I baked for about 3 minutes (I normally do about 5 for full cheesecakes) even though the directions didn’t say to. It certainly didn’t hurt anything! 2. Mix sweetened condensed milk and water in medium saucepan. When well mixed, add pudding mix and cook over medium heat until it is thick and bubbly. 3. Beat softened cream cheese until light and fluffy. Add eggs and vanilla. When well blended, add butterscotch mixture to it. 4. Fill cheesecake pan (or mini muffin cups!) They puff up quite a bit when they bake, but as soon as they start to cool they (more than) sink in, so keep that in mind and go ahead and fill ’em up. 5. For full cheesecake, bake for 50 minutes or until edges start to turn brown. The center will be a bit wobbly still. For the mini cups, I decided to make for 13 minutes and test it out. Both sizes passed the toothpick test (stick a toothpick in the center; if it comes out clean, you’re good to go!) so I yanked them. 6. Let cool to room temperature, then place in refrigerator. To serve, add a dollop of whipped cream or Cool Whip and top with crushed butterscotch hard candies. 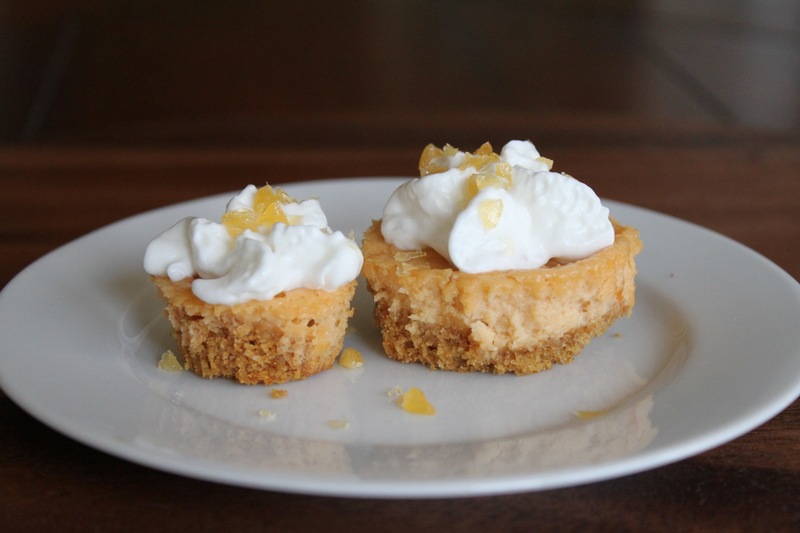 This is a great twist on a classic cheesecake with just a hint of butterscotch! I’ll definitely be making these again and again. I’d say they could be frozen up to 1 month for maximum deliciousness. Thaw in the refrigerator (probably overnight if a whole cheesecake). And enjoy!